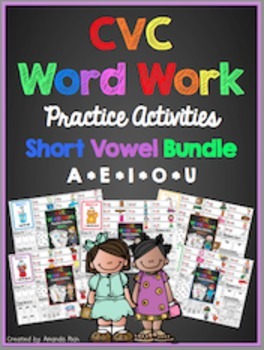 "Short Vowel CVC Word Work Activities Bundle" is a packet designed to help your students practice reading, spelling, and writing Short A,E,I,O,U CVC words. -Draw It! Activity for each Short Vowel - students read the CVC word and then draw a picture to match the word. -I Spy Activity for each Short Vowel - students search for CVC words that match the short vowel sound they are working on/studying. They read the words on the page and use a highlighter to color the words that match the vowel sound they are looking for. 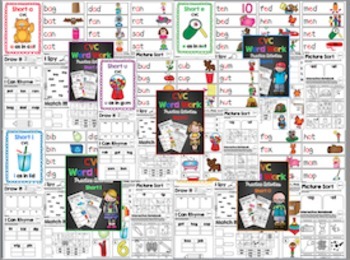 -Picture Sort for each Short Vowel - Students will cut, sort, and glue pictures of words from CVC word families. -I Can Rhyme! Activity for each Short Vowel - Students will read CVC words and then think of two words that rhyme with the word and record their thinking. -Match It! Activity for each Short Vowel - Students will cut, match, and glue pictures of CVC words with the correct spelling of the word. 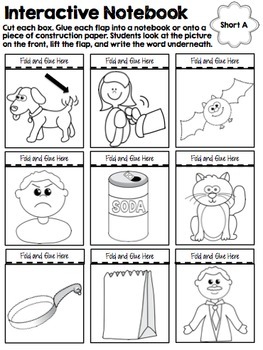 -Interactive Notebook Activity for each Short Vowel - Students will cut out flaps with pictures of CVC words. They will glue the flaps in their notebooks and record the spelling of the word under the flap. -Search, Find, Spell Activity for each Short Vowel - Teacher will place pictures of CVC words in various places around the classroom. Students will search for the pictures. 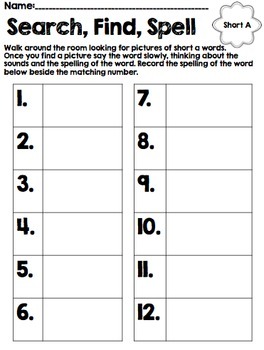 Once a picture is found, students will think about the spelling of the word and record their thinking on the Search, Find, Spell recording sheet.